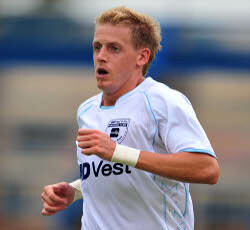 Michael Morton rose through the ranks at Orlando Pirates and Wits University before moving on to Maritzburg United. It was here that he really starred and was rewarded by earning the captaincy while playing alongside seasoned veterans like Delron Buckley, Shu-aib Walters & Dillon Sheppard. 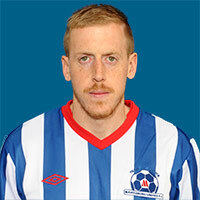 Morton has now signed a pre-contract with Supersport United and will join up with his new club on the 1 July. Until then he has a small matter of a Nedbank Cup Semi-Final to deal with. 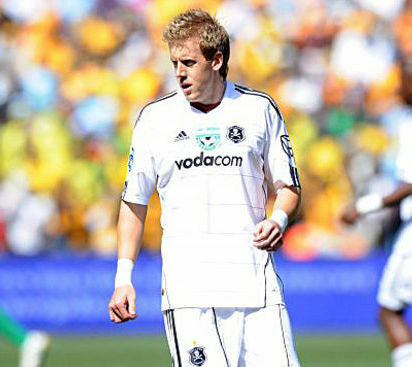 We chatted to the Martizburg skipper about all things football. ATJ: Firstly thank you for letting us interview you! 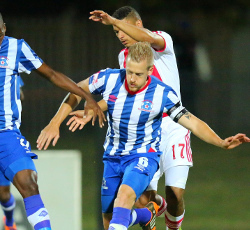 You’re club captain at Maritzburg United, what has this challenge been like for you as a player? MM: Well it was obviously my first experience at leading a PSL side, and being 24 when I took on the role it was obviously a challenge. I have always embraced leadership positions from a young age, but having being made captain with the likes of Dillon Shepard and Delron Buckley in the side, who are players I looked up to growing up, was intimidating initially but I have really enjoyed the role this season. ATJ: Moving to Supersport United is a big move in your career, what does this move mean for you as a player? MM: I spent 3 years at Maritzburg United, and it was a great period in my career and I feel I’ve really grown under the guidance of Ernst Middendorp. I felt it was a time of my career that I had to make a move to challenge myself again. When I look at Supersport over the last 5-6 years they are probably one of the biggest and most successful sides in the country and I just feel like it’s the challenge I need for my career at this point. ATJ: You got to develop through the youth system at Orlando Pirates, one of the best in the country, how did this help your development as a player? MM: I spent 7 years at the Orlando Pirates development, so I feel like the foundation was definitely set during those years. I learnt a great deal and they definitely shaped me into the player I am today. ATJ: You’ve played for South Africa at Under-23 level, what was that experience like and do you think you can be a future national player? MM: It was an incredible experience; I have always cherished putting on the national colours. Traveling the continent, experiencing different cultures was also something I really enjoyed. I would love nothing more than to graduate to the senior national team; it has always been a dream of mine. I just have to keep on turning in the performances and try to stay consistent and hopefully that results in that elusive call up. ATJ: Who has been the hardest opponent you’ve faced? MM: Players like Teko Modise and Bernard Parker. Genuine number 10’s that play in the pocket with a lot of movement are often the biggest challenge. At the same time it’s the type of players as a defensive midfielder that you enjoy testing yourself against. ATJ: Away from those that you have played against, who has been the most talented player you’ve played alongside? MM: Sibusiso Vilakazi from Bidvest Wits is probably one of the most talented players in the country, I really enjoyed my time playing with him and he’s definitely someone I see making a huge impact in South Africa over the next few years. ATJ: Incredibly, you’ve done some coaching already, is this something you see yourself doing after your playing career is done? MM: I do enjoy coaching kids, it is very rewarding and it is something I would definitely like to do even if not as a career but as a something to do in my spare time. Whether that passion translates into coaching as a career we’ll have to see, hopefully I’m a couple of years away from having to think about that. ATJ: And you have also been fortunate enough to play in a host of venues, which stadium is your favourite to play in? MM: Definitely Soccer City (FNB Stadium), it is where I won my first trophy and the memory of that day will live with me for a long time. ATJ: In both your professional and person life, who inspires you? MM: In my football career, Steven Gerrard has been my role model and someone I have always looked up to. His desire and commitment to the game and never say die attitude is something I have always tried to emulate. In terms of leadership Steve Waugh was always an inspiration, how he always seemed to lead from the front and his tough nature was something I had a lot of respect for. Off the field my mother is still an inspiration and I probably get my work ethic from her. ATJ: What are your ambitions for the remainder of this current season? MM: Well, the top 8 seems just out of our reach, but as long as it’s mathematically possible for us we’ll keep pushing for that. The focus has definitely now shifted to the Nedbank Cup where we find ourselves in the semi-final and finishing off at Maritzburg United with a trophy would be incredible. ATJ: Do you see yourself moving overseas? If so, which league would you love be able to play in? MM: I have always dreamed about playing abroad and testing myself in the top leagues in the world. I am a huge Liverpool supporter and having followed the English Premier League from a young age, naturally that is where I would love to see myself playing. I am also a big admirer of German football and the physicality of their game, so playing there would also be a dream come true. ATJ: As All Things Jabu is a sports blog, which other sports do you follow and who do you support? MM: I love my cricket and rugby. Test match cricket is a big favourite of mine as well as Super Rugby. While I don’t necessarily have a favourite team I really enjoy watching Dale Steyn, AB De Villiers and Michael Clarke. On the rugby field, I like the hard men Francios Louw, Duane Vermeulen, Rene Ranger and Conrad Smith. ATJ: Where can our fans find you on Twitter? ATJ: Thanks Michael. 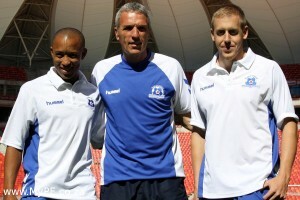 Good luck for the Nedbank Cup Semi Final. We look forward to seeing you lift a trophy before heading to Pretoria.